While Cape Breton Island is part of the province of Nova Scotia, it has a look and feel all its own. European influences arrived early in these eastern extremes of North America. The Mi’kmaq natives reportedly traded with European fishermen as early as the 1520s. From 1713-1763 the French were in control and temporarily renamed Cape Breton “Île Royale,” and from 1784 to 1820 it was its own British colony administrated separately from Nova Scotia, so its unique identity has deep roots. We’d be lying if we said the website cbiftrumpwins.com didn’t partially inspire this whole trip. The cheeky marketing campaign went viral in summer 2016 and was our first introduction to the island’s allure. As we discovered, their words and photos need no embellishment as Cape Breton Island is truly wonderful. This would also mark the farthest points from home on our entire journey. Getting into the Gaelic spirit. Cape Breton Island makes up about a fifth of the land area of Nova Scotia and has been connected to the mainland by the 1,385 meter Canso Causeway since 1955. We passed under the welcoming green archway and turned left up the western coast on the Ceilidh Trail (Pronounced “kay-lee”, more on that shortly). It wasn’t the only unpronounceable sign we came across, as Scottish Gaelic is spoken by enough people that the road signs are bilingual accordingly. The first permanent Scottish settlement on the island was the town of Judique, and it would be our first stop as well. 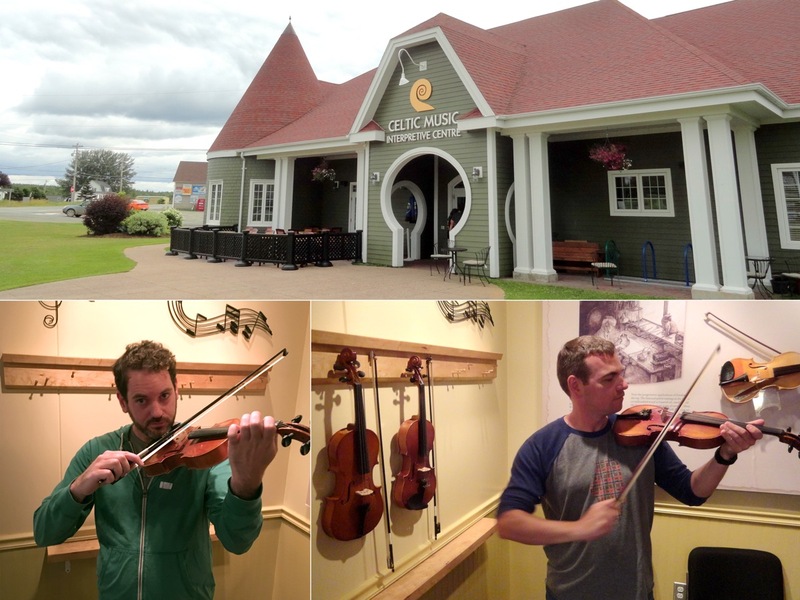 It is home to the Celtic Music Interpretive Center, a museum dedicated to the history, culture and music of Cape Breton Island. It also contains a pub presenting live music every day from mid-June through mid-October. Our favorite part was the interactive displays that teach visitors basic step dancing and fiddling. Needless to say, both our stepping and fiddling could use some practice, but we had fun trying. The best bit of trivia we learned is that the bagpipe scale only has nine notes … no wonder it sounds like they’re always playing the same song. Our first overnight stay on the island was booked in the tiny village of Mabou, just 25 minutes down the road from Judique. The 10-unit Mabou River Inn offers motel-style rooms or larger apartment/suites. Our narrow, single-queen room was located on the lower level with a private bathroom just across the hall, a minor inconvenience but not a deal-breaker. A short walk across the river and into the “center” of Mabou led us to the Red Shoe Pub, a long-standing, family-run food, booze and music establishment that is a favorite of locals and visitors alike. The place was already hopping at 6:00, with all tables full and the duo of Donna Marie DeWolfe & Amanda MacDougal rocking out on piano and fiddle for the nightly ceilidh. Historically, a ceilidh was simply a casual Scottish or Irish social gathering, frequently in a home; we saw the term “kitchen party” get used from time to time in Cape Breton. Today’s versions are usually provided as entertainment in restaurants and bars and feature Gaelic folk music and sometimes dancing. It’s hard not to be in a good mood with traditional music and home cooking being served up. It was a perfect welcome to Cape Breton Island. Glenora Distillery ceilidh at full strength. 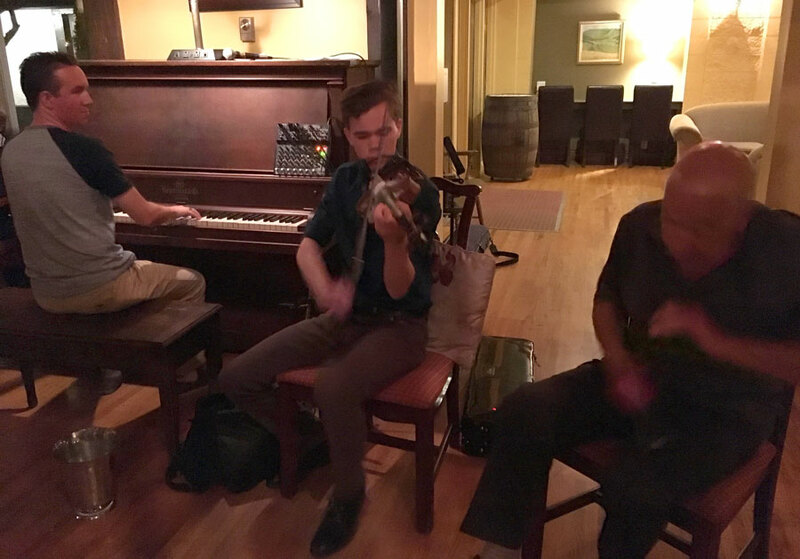 Having checked the area ceilidh schedules, we knew the Red Shoe Pub’s ended at 7:00, so after dinner we made it a double header by continuing to Glenora Distillery for their 8:00 to 10:00 ceilidh. Glenora is one of only four Scottish-style whiskey distilleries in Canada, and it’s surrounded by gorgeous green hills, so there are plenty of reasons to go there anyway. The ruckus from the dimly-lit bar was audible as we approached the distillery complex. Upon entering the Washback Pub we found a full house and two young guys playing the piano and fiddle. Being later in the evening and with boozier guests, this one was even more high-energy than the Red Shoe Pub. We each had a Manhattan cocktail and an ounce of Glenora’s 14 Year Whiskey while we took it all in. At one point, a man got up from the bar and wildly accompanied the musicians with a set of spoons. He later introduced himself to us as Jerry DaVoe, a local celebrity famous for his spooning skills. Shortly after, when we noticed a girl applying rosin to a fiddle bow, we knew there was about to be a duet. It’s like everyone in Cape Breton has a musical instrument ready to go at any moment’s notice. The highlight of the evening was when the fiddle player seemed to be taking a break, but was actually assembling a bagpipe to keep the party going. Piping in any enclosed room is loud, but a bagpipe at two meters is pretty deafening. We loved every minute of it. If you want, you can stay in a hotel room or cabin right on site at Glenora Distillery, but we headed back to our accommodations in Mabou to turn in. The following morning we stopped for a walk on scenic Inverness Beach while continuing north on the Ceilidh Trail. North of Mabou, the landscape of Cape Breton becomes increasingly rugged and hilly. The whole island generally tilts upward from low hills in the southwest to the highland plateau of the northern peninsula. Near the town of Margaree, we reached the end of the Ceilidh Trail and joined the Cabot Trail. This highway loops around the northern highlands and features some of the most stunning views in Nova Scotia. It was originally built to provide a reliable road connection across the nearly impenetrable highlands, but today it’s best know for its scenery and access to one of eastern Canada’s premier national parks, Cape Breton Highlands. This park is known for unique geology, major biodiversity and excellent hiking on its 26 trails. 90 percent of the park is made up of the highland plateau, but around its edges, it descends abruptly all the way to sea level. Vegetation is defined by elevation, with lush Acadian forests down low, Boreal forests in the middle and sparsely covered taiga topping out around 530 meters. 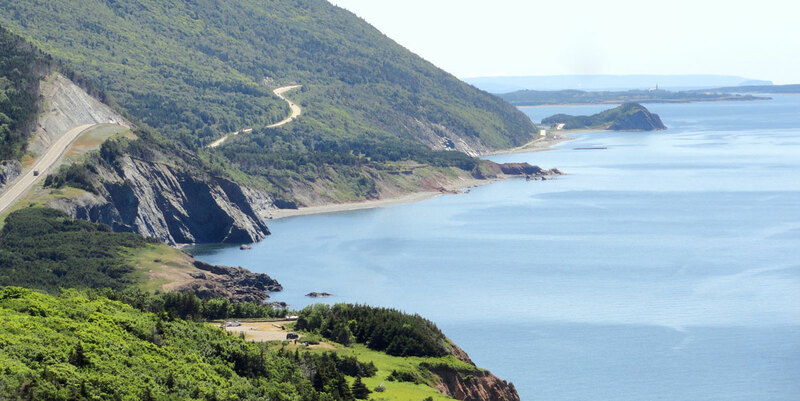 The Cabot Trail hugs the shoreline of Cape Breton Highlands National Park. We got our bearings at the main visitor center on the western side of the park near Chéticamp, and made a plan for the first afternoon. We doubled back to the edge of town to pick up sandwiches at Boulangerie Aucoin, a French-style bakery that has been serving breads, sandwiches, pastries and tea since 1959. With lunch and dessert in our backpacks, we drove along the coast to the Corney Brook trailhead. This 6.5km out-and-back hike took us deep into a river canyon with a nice waterfall at the end. It has 140 meters of elevation gain spread out over a gradual incline. A simple bench facing the waterfall made a perfect secluded picnic spot with a soundtrack of falling water. (Aucoin’s flaky blueberry turnover will appear on 2017’s best-of list.) After the hike we stopped at a few of the scenic pullouts along this dramatic section of the Cabot Trail. The road clinging to the steep bluffs looks awesome from any angle, and at Presqu’ile we scrambled along a rocky beach with sea stacks. Next it was time to check in to our accommodations at Albert’s Motel back in Chéticamp. This town has been a center of Acadian heritage since they returned to settle here on land unclaimed by the English after their deportation in the Grand Dérangement. It’s a great base for exploring the western side of Cape Breton Highlands. We sat on our front porch at the motel and briefly rested before our next hiking adventure. Months prior to our arrival in Cape Breton, we reserved slots in the nightly ranger-guided Sunset Hike on the Skyline Trail. The hike begins 2 hours before sunset, so on July 26th that meant we had a bit of time to kill before the 6:45 departure. We traversed the seaside section of the Cabot Trail for the third time that day, and made our way to the Bog Hiking Trail high atop the French Mountain plateau. This boardwalk trail is just a half kilometer in length, but it passes through a fascinating highland bog landscape. 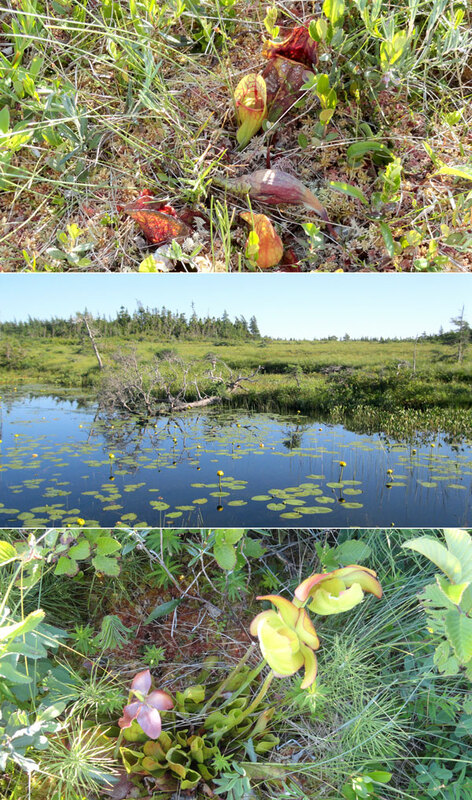 Orchids, dragonflies and carnivorous pitcher plants inhabit the squishy ground along the route, and moose are said to frequent the area (though we didn’t see any). The quick 20 minute walk was the perfect time-filler, as we arrived back at the Skyline Trailhead at just the right time to meet our ranger guide. After some basic introduction talk, he led us into the woods on the 7 kilometer round trip hike. The first couple kilometers are pretty flat, passing through varied boreal forests. Just as we stopped to discuss some trees, hikers coming from the opposite direction told us they had just passed a moose near the trail a few minutes prior. Our guide polled the group on whether to sidetrack to try to see the moose or continue on our normally planned route. We’ve found the goofy animals to be extremely elusive, so we were happy it was a unanimous decision in favor of the moose expedition. About five minutes down a branch of the trail we came upon a 2-year-old female grazing at the edge of a grassy clearing about 20 meters away. Everyone came to a halt and went silent other than the clicking and beeping of cameras. She didn’t seem to mind having an audience as she calmly enjoyed the greenery. 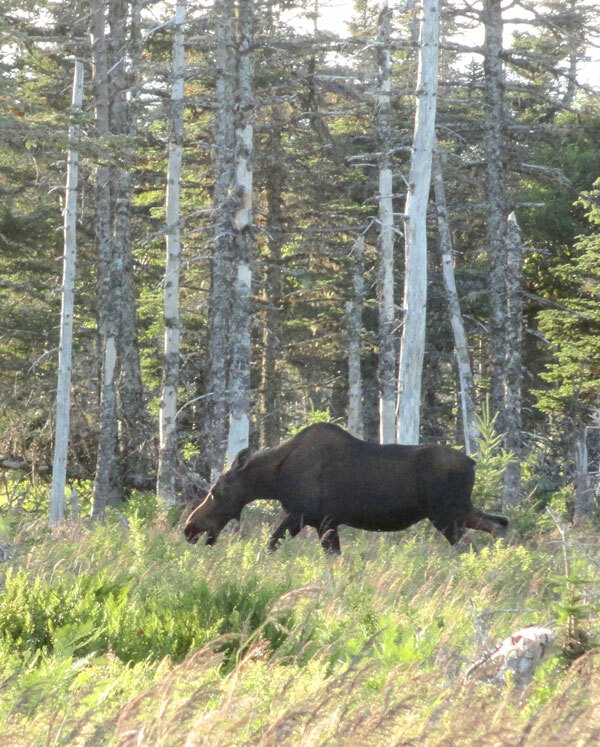 In the book “The Tent Dwellers,” author Albert Bigelow Paine states “I may say here that no expedition in Nova Scotia is a success without having seen at least one moose.” This marked the first time we’d seen a moose in the wild since 2014 in Alaska. Continuing on the Sunset Hike, we reached a point where the views start to open up. Off to the left we looked into the deep valley where the Cabot Trail snakes along the hills toward the sea, and straight ahead the ocean began to fill the horizon. Soon after, we emerged from some low trees onto an open, rocky ridge, and a breathtaking view spread out before us. The last few hundred meters of the Skyline Trail consist of a series of boardwalk stairs and platforms cascading down the ridge with panoramic views over the Gulf of St. Lawrence. As the sun lowered, it cast a changing reddish glow on the landscape. It would prove to be one of the defining images of the whole trip. 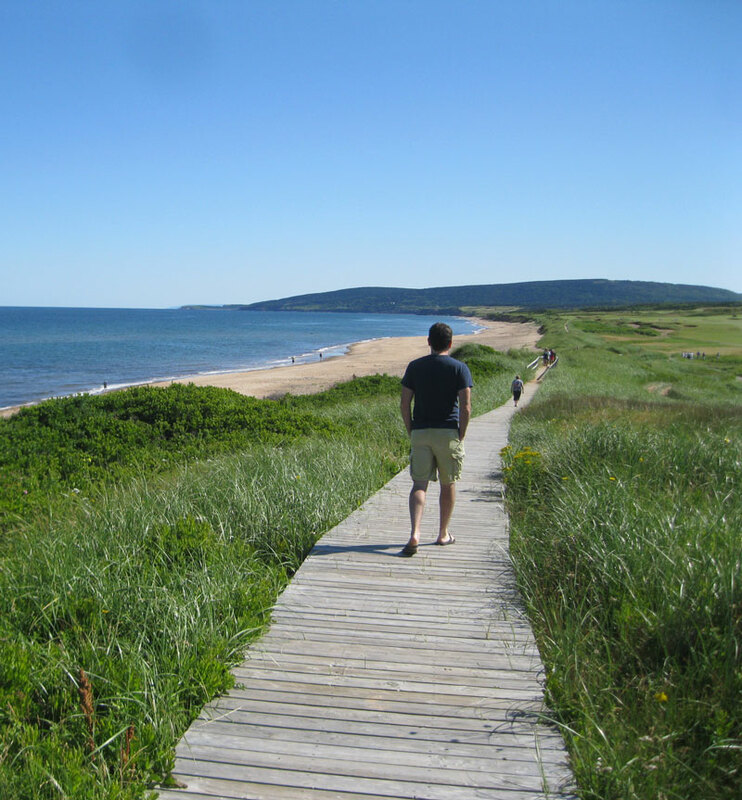 This view features prominently in Cape Breton marketing materials, but the real experience of standing on the edge of that island simply cannot be recreated in photographs. We put our cameras in our pockets and stood quietly while recording it in our minds. The guided portion of the hike was finished at this point, and guests could hike back to the trailhead at their own pace if they chose. We lingered until the sun disappeared completely and it was fully dark by the time we arrived at the car and drove back to Chéticamp. Late evening activities in remote areas often mean reduced dining options, so our best bet was to order a giant to-go pizza from Wabo’s to enjoy back in our hotel room. We were justifiably carbo-loading, as we had much more to discover on Cape Breton Island. This entry was posted in Destinations, Travelogues and tagged Boulangerie Aucoin, Cabot Trail, Cape Breton Highlands, Cape Breton Island, Ceilidh Trail, Celtic Music Interpretive Center, Glenora Distillery, Mabou, Nova Scotia Road Trip, Red Shoe Pub, Skyline Trail, Sunset Hike Cape Breton, Travel Canada. Bookmark the permalink.